Varnished, Set-up and Ready to Play! 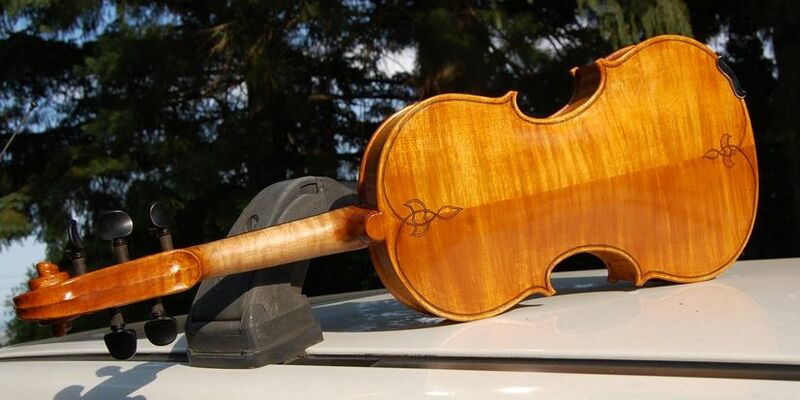 Here’s the most recent five-string fiddle, handmade in Oregon, varnished and ready to play. The sound is balanced across all strings and has good volume. I guess I would say it still sounds a bit “new”, but that is to be expected with less than five minutes play time. The strings are Helicore, and were sold specifically for a five string fiddle. I have set them up with Dominants, and they sound good that way, too. I am looking forward to hearing a good fiddler (old-time, country, bluegrass, celtic) put this one through its paces. Or a violist or a violinist…I’m not particular. Really looks nice Chet……couldn’t see the side view ! No idea why– it is there… Glad you like it, anyway. Thanks for the ehcouragement. After I sent you the message the image showed ! I really like the purfling design on the back ! Did use a knife or router ? I used a knife–my experiences with router (Dremel) purfling have not been encouraging. It is too easy to lose control and do something you didn’t intend…and it doesn’t make a slice, it makes a slot. When that happened, I cut a piece of wood and filled the slot, then re-cut with a knife, but it was a real bother.